Fuelled with porridge, I rode to work this morning! My second time ever. Don is a bit of a daredevil when it comes to riding, so after a very rusty start** from me, we were quickly up and amongst the traffic. Normally it takes us about 15-25min (traffic dependent) to drive to our car spot and another 15-20min to walk to our respective workplaces. Today it took Don 15min to ride door to door. 15min! It took me around 25-30min (I didn’t time it) and was a little more of a workout. Riding home was another thing entirely. Don took another 15min – uphill. 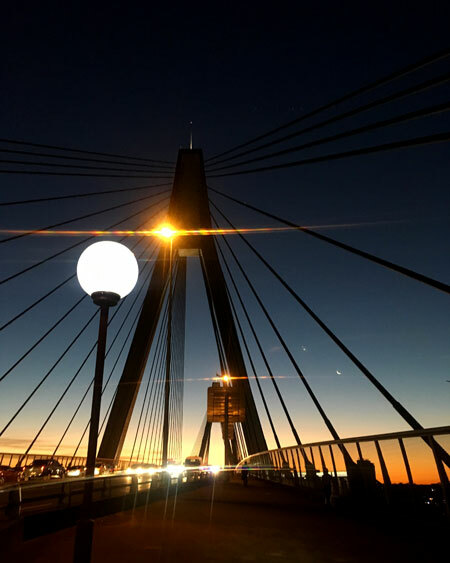 Because it was dark when I left SML, I rode over ANZAC bridge (the equivalent of a big hill) and kept to bike paths/lanes – took a bit longer, but I felt more comfortable that way. Don’s route is pretty straightforward, but I have loads of options to explore. 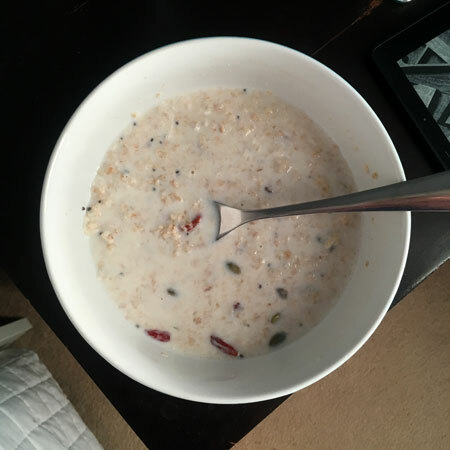 I felt brilliant afterward – post-exercise endorphins are a wonderful thing! Now though, I’m knackered in a way I’m really unaccustomed to – which is fabulous. We’re definitely going to do this on the regular. ** I’ve kept this pretty quiet, but a couple of months ago I acquired a wonderful and gorgeous carbon-framed road bike. Poor Corey-the-hybrid was languishing unloved in the garage because I was holding onto him for possible bike-commuting purposes. The gears are completely different on both bikes and my brain was really struggling to remember just how mountain bike gears worked – I kept shifting down when I meant up and vice versa.